I've written before about the weirdly unfinished process of "finishing" a manuscript. It doesn't seem like three years since I was last in this position -- gulp, I just checked, and it's closer to four years, actually. 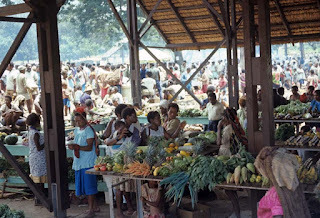 New Guinea Moon has been a long time in the writing, and there are many, many versions of it buried in the depths of this laptop. I knew I wanted to write something about PNG in the 1970s, but I wasn't quite sure what. Slowly this story struggled to the surface, took shape, sank and re-emerged. The ending didn't reveal itself until the very last draft, so in some ways, the manuscript that I showed to the Onions was still quite unfinished. They had some helpful suggestions about ways to improve what I'd written, and now I've reached the point where I've revised as best I can, and it's time to send it off again. As late as this morning, under the shower, I thought of a bit to put in - just a few lines, but hopefully it will make this one scene clearer, stronger, better. I don't need to send the manuscript off until the end of the week, so no doubt I'll think of something else to add, or something else to cut. But I will never know exactly what that final alteration will be. There is still editing to do, of course -- with luck, not major surgery, but tweaks here and there -- a line removed or shifted, a word added or deleted. But there never seems to be a moment, like there is in the movies, when you rule a line under the story and triumphantly write THE END! Finishing off a book, like beginning to write one, is a strange, dribbly, blurred process. Not unpleasant, but in some ways, oddly dissatisfying. It can be hard to let go, to admit that no amount of tweaking will make your flawed manuscript match the shining ideal you held in your head before you began to write. It's hard to hand it over into the care of others. It's hard to say goodbye. And weirdly, now that I'm writing this, I can see the parallels between my own mixed feelings about saying goodbye to this novel, and the feelings that led me to want to write it in the first place - my own stubborn attachment to a place where I lived for six years, the place that shaped my childhood and my family's history; and my protagonist, Julie, who also has trouble saying goodbye. Yesterday was Roald Dahl Day for the Grade 1/2s at our school. Evie dressed herself up as one of the baby foxes from Fantastic Mr Fox. She made her own ears and devised a tail from a little (fake) fur jerkin. However, the foxes are certainly very cute. Especially this one. 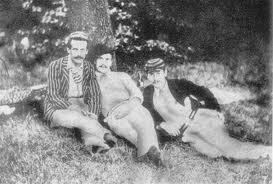 From left: the original George, the original Harris and 'J' Jerome K. Jerome. Imaginary dog not pictured. So I've been reading Three Men In A Boat to Alice. Written in 1889 by journalist and humorist Jerome K. Jerome, this slim and well-loved volume chronicles the adventures and misadventures of three young men (to say nothing of the dog, Montmorency) as they take a leisurely two week trip up the Thames. There are lots of poetical descriptions of the landscape (which Alice found dull) and history lessons, as they pass various towns and grand houses (which Alice found moderately interesting, so long as we could tie it into Horrible Histories -- the Saxons had us pretty baffled though). But her favourite parts of the narrative were the tall tales the three friends share (like George getting lost in the maze) and the silly accidents that befall them along the way - the tins that won't open, the boat cover that refuses to go up, the huge fish in the pub that every man who wanders in claims to have caught, and which eventually (after an unfortunate accident in which Harris climbs on the back of a chair to examine said fish more closely, but knocks it down and smashes it into a million pieces) proves to have been made of plaster all along. The three men were closely based on Jerome himself and his two friends Carl Hentschel (renamed Harris) and George Wingrove. Only Montmorency the dog was entirely invented, which is a fact I'm reluctant to pass on to Alice after her reaction to the ending of the book. You see, the three men jump ship. They've sworn themselves to a fortnight's holiday, but the weather in the last few days is so unrelentingly terrible, they abandon the boat with two days to go, take a train back to town and treat themselves to a slap-up meal and a trip to the theatre instead. It emerged that she felt cheated of another two days' worth of anecdotage and misadventure. In her view, sending the three men home early was sheer laziness on the part of the author, and she is not prepared to forgive it. * He featured in Who Do You Think You Are? as a crusading journalist who ruined Emilia Fox's ancestor's name. Long story. Kate Constable has taken a complex and contentious topic and handled it with a deftness that will be enjoyed by a casual reader but will be long considered by a thoughtful one. As race relations in this country are still being negotiated, this novel reminds us of past injustices while offering hope for a better future. Mysterious, complex and challenging, Only Ever Always is a beautifully written story of parallel lives where Claire in the now, and Clara in a dystopian, timeless world, each face similar difficulties. Is one the dreamer, the other the dream, and if so, which? Changing voices, points of view and place make this a very satisfying novel for a reader willing to give it the close attention it deserves. Couldn't have put it better myself! Congratulations, Pen. This was an impulse buy from the library book sale, but I was unexpectedly beguiled by it. 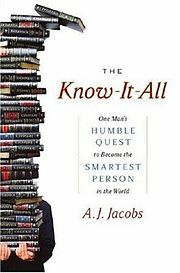 AJ Jacobs, once convinced he was the smartest boy in the world, and horrified by the slow leaking of knowledge (and intelligence?) from his once-agile mind, resolves to regain his mental ascendancy by reading the entire Encyclopaedia Britannica from A to Z. This is the true story of his quest, liberally punctuated with bizarre and fascinating snippets of information gleaned from each volume. It's also a personal memoir of the year or so he spent cramming all that knowledge into his depleted brain - his attempts to outdo his (extremely smart and somewhat competitive) father and brother-in-law; his and his wife's simultaneous quest to get pregnant; his appearance on Who Wants To Be a Millionaire? The thing is, I can totally relate to the idea of reading the encyclopaedia from beginning to end, though admittedly it's the kind of project I would have embarked on when I was thirteen rather than thirty five. I love QI (have I mentioned that?) and some of my happiest moments have been spent (modestly) beating others at Trivial Pursuit or whipping out some obscure factoid to take the lead at a quiz night. On the slightly disturbing side, I found that I actually already knew at least half -- maybe even three quarters -- of the obscure trivia with which Jacobs liberally besprinkles his tale. Is it possible to watch too much QI? Horrors. Another rather sad footnote: it's no longer possible to emulate AJ Jacobs' feat (not with a current edition, anyway). A few years after this book was written, Encyclopaedia Britannica stopped producing hard copy volumes and is now available in on-line form only. It's just not the same. News Just In: Richard III's Body Found? How cool is this? Archaeologists digging up a car park in Leicester have found a skeleton which they think may be the long-lost body of Richard III. They are doing DNA tests with a descendent of Richard's sister, Anne of York, to check. The male skeleton does not have a hunchback or a withered arm, but it does have a curved spine, which would have made the right shoulder sit higher than the other, consistent with contemporary descriptions of Richard. 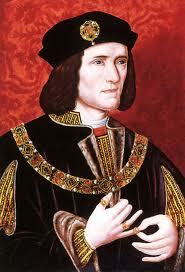 History has long argued about the comparative villainy or heroism of Richard III. Did he murder his nephews, the Princes in the Tower? Josephine Tey thought not; Sonya Hartnett is not so sure. I did a project about this in high school (after reading Daughter of Time!) and concluded that Richard was innocent; now I'm not so sure, either. Alice and I were watching an episode of QI last night, where they were discussing horses. 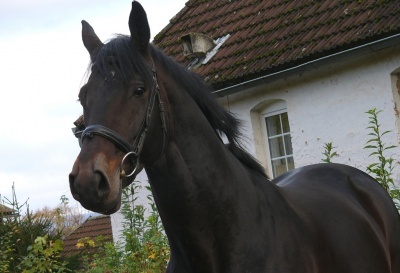 One of the panellists remarked that a certain piece of sad music always made her cry, because it reminded her of Black Beauty, when Ginger died. Obviously there's a gap in the market for a really gripping kids book about nuns. Maybe a pop up? Spring is puppies playing in the grass. Bees flying slow and fast. 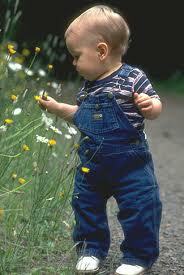 Spring is just simply gold! Birds singing in the evening breeze. The sun will allways come out again! 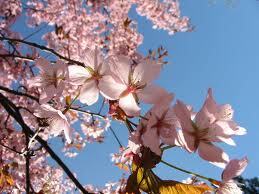 All because of spring's bright light! While around the land spring spreads. So we stumbled into a bit of a drama at school this morning. I was signing in the girls (late, oh dear...) at reception when a distraught mum rushed in and stammered to the admin office lady that she'd lost her two year old, a little boy in a green jacket, could she put out an announcement please? Then she rushed away again. The admin office lady made an announcement over the PA, I shooed the girls off to class and set off to join the search. But lo and behold, I didn't even get as far as the door when I spied a little boy in a green jacket strolling happily down the corridor. So I called his name and took his hand and we went to find his mum. Two minutes later they were reunited, the frantic search was called off, and all was well. The little boy himself was completely unperturbed by all the fuss. But what upset me a little was how distressed his mum was. 'I'm such a bad mother,' she sobbed, tears rolling down her cheeks. Another mum and I patted her back and told her not to be silly, it happens to everyone -- and really, if you think about it, a primary school on a quiet street is a pretty good place to lose a toddler. There were lots of people around to help, and not much trouble to get into. Of course it's deeply scary to mislay a small child, even for a few minutes, but it was very unlikely that this story would have anything other than a happy ending. I really hope this mother isn't going to spend the rest of the day beating herself up about what a terrible parent she is, when the only thing that happened was that her confident, comfortable little boy went exploring, in an overwhelmingly safe environment, and was out of her sight for a few minutes. This is where I've found the excellent Lenore Skenazy and Free Range Kids such a boon. She talks about the dangers of "worst-first" thinking, the astronomical unlikelihood of the actual worst-case scenario happening, and the very real harms and dangers that result from smothering our kids and not allowing them to face any risks, however minor. (There are also inadvertently hilarious, and frequently disturbing, stories about what happens when people take the no-risk-is-acceptable approach waaay too far.) Do check it out. It has come to my attention, when listening to the rather (ahem) conservative radio station that I tune to in the footy season, that their news service enjoys an interesting turn of phrase when it comes to public funding. "Bad" things (like police presence at strikes, or welfare payments) "cost the taxpayer x millions of dollars." "Good" things (like upgrading sports facilities) are merely "paid for by the government." Which is an altogether different thing, obviously. 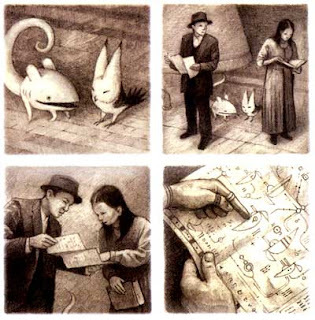 It might have been reading Shaun Tan's brilliant, wordless exploration of the migrant experience, The Arrival for book group, that started me on what seems to be an ongoing quest, but I seem to be picking up stories about refugees at the moment. I was halfway through Neil Grant's The Ink Bridge when I found out it had won the Queensland Literary Award for YA (well, maybe this was sort of inspired by doing a school gig at the same time as Neil and remembering that I hadn't read The Ink Bridge yet -- and I'm so glad I did, though the first half was a pretty harrowing reading experience.) Congratulations, Neil! Now I'm reading Anh Do's The Happiest Refugee, also much awarded, and waiting next on the pile beside the bed, I have Her Father's Daughter by Alice Pung. Any suggestions for other similarly themed books I might have missed? It is easier to blog every day than once a week.